There are so many health benefits to juicing and it really does depend on your individual health as to what blends of juice would be most beneficial for you. However, opting for a green or colourful juice would safely benefit everyone to some degree. You can create certain juice blends for certain ailments or goals, however as long as the fruits and vegetables are fresh, free of chemicals and organic when possible, you can't really go wrong. Colourful vegetables have a higher volume of sugar and they are full of nutrients that are essential for living, however load your juice up with plenty of greens as well. This ensures you gain variety of vitamins and minerals, with dynamic healing capacities for optimal energy, cellular functioning, repair and regeneration of your body. Drinking just one freshly prepared juice on an empty stomach each morning is likened to an intravenous infusion of minerals, vitamins and enzymes, as they hit your blood stream immediately. This takes the pressure off your digestive system. As most people nowadays have an impaired digestive system (due to stress, poor food choices and lifestyle factors), it can be difficult to assimilate all the nutrients from your food. Juicing eases this process, so you will assimilate most of the nutrients at once and notice the benefits and boost almost immediately. As above, have your juice on an empty stomach in the morning to ensure optimal assimilation and ease on the digestive system. Avoid eating anything for at least 20 minutes after juicing. Alternate your fruits and vegetables to keep a variety of vitamins, minerals and enzymes. Use a cold-pressed juicer for the highest quality juice. Cold-pressed juice stays fresher for longer and the enzymes remain alive. This means you can press your juice and carry it with you for the day, maintaining the quality of the juice. Centrifugal juicers require you to drink the juice as soon as it is pressed, as the enzymes will die off if left too long before drinking. Wash all produce prior to juicing to remove any pathogens, chemicals and unfriendly bacteria. Wash with apple cider vinegar and water. If possible, opt for organic or local fresh produce for optimal nutrients. Ginger is a powerful addition as it is anti-inflammatory, gives a boost to your immune system and supports digestion, plus so much more. Increased energy - when you assimilate more nutrients from your food, it goes without saying that you will feel more energised. 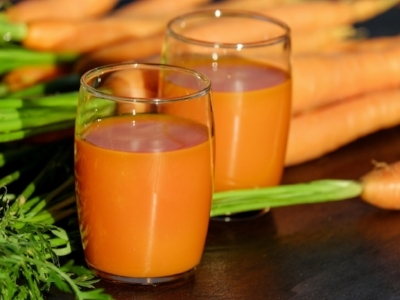 Juicing provides immediate energy to the mind and body. Promotes weight loss - your body is provided with essential vitamins, minerals and enzymes that are absorbed quickly and are readily available to use as energy and to heal. When we have the correct nutrition onboard, it is much easier to lose that excess weight. Gives your digestive system a longer fasted overnight break, as you will most likely start breakfast later after having your juice. So what did I notice once I began my morning juice routine? I must say, initially I was quite hungry for my breakfast and it took some strength to hold off from eating until 20 minutes after the juice, but I was determined to do it. As the days went on, I found that I really looked forward to my juice, I changed up my fruits and vegetables every few days and I became quite creative. I began to notice that my energy levels significantly increased only minutes after drinking my juice. My head felt clearer and my hunger levels began to improve. I soon noticed that I was receiving enough vitamins, minerals and enzymes that I didn't rely on my 6:30am breakfast so much, as I felt satisfied for longer. As a result, I've now pushed my breakfast out to a bit later in the morning and I feel SO much better for this. Due to having a longer overnight fast, my digestion improved even though it was fairly good and my body overall started to feel healthier. Like I said, everyone is different and this is why I take an individualised approach with my clients, to determine the best options depending on your own unique goals, health status and history. Always work with a health practitioner if you're unsure whether this is for you, however when it comes to juicing, the benefits are endless. Give it a go and let the results speak for themselves! To help you navigate your way through the different types of juicers and gain the most value for money, take a read of this review to help with your decision. Enjoy!